ESD shoes, shorthand for Electrostatic Dissipative shoes, are worn by those who work with electricity day in and day out and thus, are more likely to be exposed to voltage. Electrical resistance of the safety shoes counts even more if the wearer works in situations that involve working with microchips, hard drives, or other similar products. If the electrical discharge is not managed well with quality ESD shoes, the same can disrupt the very operations or cause damage to the electrical products the wearer is working with. Depending upon the work conditions, companies choose from the wide selection of ESD safety shoes. These shoes vary heavily in terms of their electrical resistance capabilities, colors, designs, and thus, prices. The things which, however, remain intact across the range are their being lightweight and comfortable. Carefully chosen materials (which go in the making of safety shoes and work boots) ensure that the wearers can go about their work with the least concern for shocks and other unwanted damage to their feet. 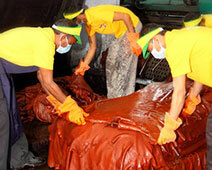 Industries also save themselves from unwanted damage to their products, workspaces, and more importantly absenteeism due to foot injuries/accidents. ESD (Electrostatic Dissipative) safety shoes and work boots are made of real leather and other fine materials for improved performance; with an electrical resistance between 0.1 and 100 Mega Ohm, the ESD shoes emerge as the best possible solution to prevent powerful and uncontrolled electrostatic charge in different industries. At Liberty, we have developed a smart collection of ESD footwear which is stylish, lightweight, comfortable, and performs even under the toughest of conditions. Explore the collection. 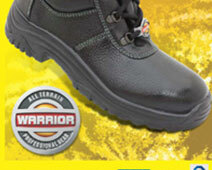 It is very difficult to find comfortable and stylish leather ESD boots, I am so glad Warrior has it.